I met six-year-old Dylan in the school office. He was sitting, with feet dangling, on the plastic-covered cot reserved for children feeling "not so good." Sydney was with Dylan and introduced us. "Ms. Ryane, this is Dylan. He's in first grade." Dylan picked at the food arranged on his small orange lunch tray. He sipped from a straw stuck in a half pint of chocolate milk. He lined up chicken nuggets nestled in a cardboard container. "Hi, Dylan," I said, and he looked up at me with a pair of startling indigo eyes. "How come you're eating your lunch here on the cot?" "I did something bad," he answered, and chewed a nugget. I looked at Sydney for clarification. "Dylan pulled the fire alarm and now he has to have lunch alone for two weeks." Two weeks?! What're we running here...Papillion? And that's when it hit me. 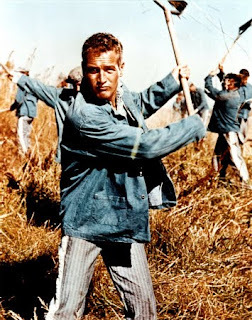 The boy had the baby blue peepers of Paul Newman or Steve McQueen. I was in the presence of a miniature "Cool Hand Luke." "Wow, Dylan...that's heavy. Why did you pull the fire alarm anyway?" "Well...really...I just wanted to know...like I just wondered...like...how it sounded." Right. 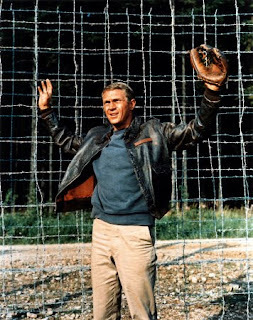 Like "The Great Escape." Got it. "Yeah...well...my mom's gonna be really, really mad...."
This is the kind of kid I look for. Curious. The kind of kid who wants to know stuff. The kind of kid that takes action, however risky it might be. I'd have to wait two years for Dylan but I intended to keep an eye on this freckled-faced outsider. Sydney tells me Dylan's mom is overrun with children and struggling to keep a lot of plates in the air. Dylan "in trouble" is the last thing the woman needs. But two weeks of eating in exile? Sydney and I shared the dismay of this sentence and he ended up getting parole a week early. At the end of a performance of "Twelfth Night," I noticed Dylan hanging on the apron of the stage. He was stretching his little arms to touch Geoffrey's foot. Like rockstars, Geoffrey and Luis were slapping palms with a crowd of kids and Dylan's face registered absolute awe. The next day I ran into Dylan and asked what he thought of the play. "It was sooo good...I love that play." "What was your favorite part, Dylan?" And stuck his foot out, pointed and said, "Yellow toes...look...look at my yellow toes." Recruited. He doesn't even know it yet, but he's in like Flint. 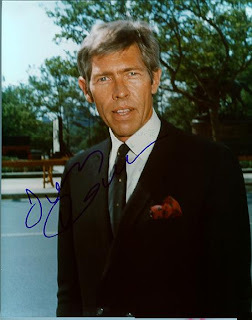 Yeah, yeah...James Coburn...another bad boy with blue eyes. When I was poor and my mom Died and my dad was a drunky so I was alone but I saw The prince of kingdoms but if I dool him for his spot but it was 20 Klames. a month later I got 20 Klames. So I duled him he was tuf but one thing I dident now that we fight until one of us died but he cut me so many times I felt like I was going to give up but I stabbed him though his chest and wone but somebody stabbed me it was his friend then I died. Spoke with Dylan today. He's lookin' good. Not on the cot yet! That's good news. Week two and no laws broken.